MUMBAI, Nov 21 (Reuters) - Indian soybean futures were down on Friday morning tracking weak Malaysian palm oil and overnight falls in the crude oil prices, analysts said. At 11:03 soybean January futures contract NSBF9 on National Commodity and Derivatives Exchange were down 1.18 percent at 1,585 rupees per 100 kg. At 11:05 a.m., benchmark Palm oil February futures contract KPOc3 on the Bursa Malaysia Derivatives Exchange was down 3 percent at 1,418 ringgit a tonne tracking overnight falls in crude oil prices. Soybean is crushed to produce edible oil, which competes with palm oil. Their prices often move in tandem. However, federal government's moves to support edible oil prices may limit the losses, they added. Nov. 21 (Bloomberg) -- Crude oil fell to the lowest since May 2005, trading almost $100 a barrel below its July record as demand drops amid a global recession. Oil is poised to drop 15 percent this week, the worst performance since Oct. 10 as the world economic crisis reduced demand growth to its weakest in 23 years. Equity markets plunged and copper has declined to 63 percent from its May record to trade at its lowest since July 2005. Crude oil for January delivery fell as much as 87 cents, or 1.8 percent, to $48.55 a barrel, and traded at $49.21 at 8:50 a.m. Singapore time on the New York Mercantile Exchange. Futures have dropped 67 percent since reaching a record $147.27 on July 11. Oil for December delivery dropped $4.68, or 8.7 percent, yesterday to expire at $49.42 a barrel. Japan's economy, the world's second-largest, will probably shrink this year and next in the first back-to-back contractions since the banking crisis a decade ago, economists say. Singapore lowered its growth forecast for a fourth time this year and said the economy may contract in 2009, adding pressure on policymakers to implement more measures to avoid a prolonged slowdown. The International Energy Agency, an adviser to 28 nations, said last week that world oil demand will rise at its slowest pace for 23 years in 2008. It cut its 2009 estimate by 670,000 barrels a day to 86.5 million barrels a day, the biggest reduction in 12 years. New York oil futures first traded above $50 on Sept. 28, 2004, in the middle of oil's six-year rally toward this year's records. Prices climbed on the strength of oil demand from emerging economies, led by China, the world's second-largest oil consumer after the U.S.
Brent crude oil for January settlement yesterday declined $3.64, or 7 percent, to $48.08 a barrel on London's ICE Futures Europe exchange, the lowest settlement since May 20, 2005. Nov. 20 (Bloomberg) -- Gold climbed for a second straight day on speculation the Federal Reserve will lower interest rates to stimulate the U.S. economy, boosting the appeal of the precious metal as an alternative asset. The yield on two-year Treasury notes dropped below 1 percent for the first time ever on bets the Fed will cut its benchmark rate next month. Gold reached a record $1,033.90 an ounce on March 17, after the Fed slashed rates 2.25 percentage points in four months. Gold futures for December delivery rose $12.70, or 1.7 percent, to $748.70 an ounce on the Comex division of the New York Mercantile Exchange. The price has dropped 11 percent this year. The Fed will lower its benchmark bank-lending rate 25 basis points to 0.75 percent, according to the median estimate of 68 economists surveyed by Bloomberg. ``With interest rates so low, that's triggering ownership of gold,'' said Ron Goodis, retail trading director at Equidex Brokerage Group Inc. in Closter, New Jersey. Other precious metals, which have wider industrial applications than gold, fell on concern that a global recession may damp demand for all commodities. The International Monetary Fund projected that economies in the U.S., Japan and the euro zone will all shrink in 2009. Copper has fallen 48 percent this year. Silver futures for December delivery fell 28.5 cents, or 3.1 percent, to $9.025 an ounce on Comex. Platinum futures for January delivery dropped $33.60, or 4.1 percent, to $790.10 an ounce on Nymex. Palladium for December delivery fell $14.40, or 7.4 percent, to $179.45 an ounce. FCPO February futures contract retrace marginally RM12 lower compare to previous trading session and close at RM1468 with a total 6566 lots traded in the market. FKLI November contract plunge 13.5 points lower as compare to previous trading session at 854.5 with a total of 6377 lots traded in the market. FKLI plunge almost 20 point at it’s lowest after Dow Jones futures trading and regional poor performance during the trading session. Technically, despite of weak sentiment within the market, FKLI seems supported above 61.8% Fibonacci figure level at 851 regions range 802 to 927. Traders were advice to hold short position provided support levels at 851 and 840 levels were violated. Resistance levels were seen at 860 and 878 region. Nov. 19 (Bloomberg) -- Gold rose for the first time this week in New York on speculation that the dollar's rally will stall, boosting the appeal of the precious metal as an alternative investment. Silver and platinum declined. The dollar was little changed against a weighted basket of six major currencies after climbing 1.2 percent in the previous two sessions. Gold and other metals often move in the opposite direction of the U.S. currency. Bullion fell 18 percent last month as the U.S. Dollar Index rallied 7.8 percent. ``The buck is definitely running out of steam, so gold bulls will soon do plenty of dollar bashing,'' said Ralph Preston, an analyst at Heritage West Futures Inc. in San Diego. Gold futures for December delivery rose $3.30, or 0.5 percent, to $736 an ounce on the Comex division of the New York Mercantile Exchange. Silver futures for December delivery fell 24 cents, or 2.5 percent, to $9.31 an ounce on Comex. Platinum futures for January delivery slid $13.30, or 1.6 percent, to $823.70 an ounce on Nymex. Palladium for December delivery dropped $21.45, or 10 percent, to $193.85 an ounce. The dollar tumbled as much as 1.4 percent against the basket of currencies before erasing losses. Gold earlier gained as much as 4.4 percent. ``For any big move in gold, we would need the dollar to come down drastically,'' said Matt Zeman, a metals trader at LaSalle Futures Group Inc. in Chicago. The Dollar Index, which includes the euro and yen, has risen 14 percent this year. Gold's gains were limited on speculation that the global recession will damp demand for all commodities. ``Big losses in equity markets are going to weigh on gold and commodities across the board,'' Zeman said. Since the second quarter of 2007, banks worldwide have posted $967.4 billion in losses and writedowns related to the credit crisis. The Standard & Poor's 500 Index of equities fell 41 percent this year before today, while the Reuters/Jefferies CRB Index of 19 commodities dropped 32 percent. Investment demand fell 58 percent to 85.3 metric tons in the third quarter compared with a year earlier, the World Gold Council said today. Institutional investors sold 296.8 tons even as demand for bars, coins and exchange-traded funds gained 382.1 tons. FCPO February futures contract surge RM44 higher compare to previous trading session and close at RM1480 with a total 8735 lots traded in the market. CPO price was traded higher in 2nd trading session as soybean oil and crude oil electronic traded upwards during trading session. Technically, CPO price seems reached 23.6% Fibonacci projection at RM1493; 50% Fibonacci projection upon completion of minor wave 5. We would expect CPO price to retrace around RM1458; 50% Fibonacci figures before continue to surge up in the coming trading session. Traders were advice to hold long position in the coming trading session once the resistance levels at RM1493 and RM1488 were breach. FKLI November contract retrace 5 points lower as compare to previous trading session at 868 with a total of 6181 lots traded in the market. FKLI plunge down after seems well support above 872 levels as Dow Jones futures electronic trading plunge during trading session. Technically, FKLI another false break above 880.5 but temporary supported above 869; 78.6% Fibonacci figures. 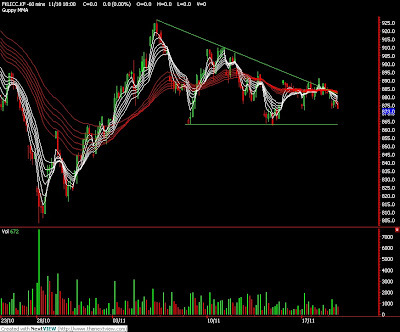 FKLI seems still trading within descending triangle range while critical supports remains at 858 and 863 regions. Resistances were seen at 880.5 and 890.5 levels. Traders were advice to ONLY hold long position provided support levels were not violated. Nov. 18 (Bloomberg) -- Gold fell for the second straight day on speculation that the slumping global economy will reduce demand for commodities, eroding the appeal of the precious metal as a hedge against inflation. Platinum gained. Prices paid to U.S. producers tumbled in October by the most on record, the Labor Department said today. The Reuters/Jefferies CRB Index of 19 raw materials is down 32 percent this year, and gold is headed for its first annual decline in eight years. Gold futures for December delivery declined $9.30, or 1.3 percent, to $732.70 an ounce on the Comex division of the New York Mercantile Exchange. The threat of inflation has moderated as prices for oil, corn and other commodities fell from records this year. Gold rallied 31 percent in 2007 as the U.S. inflation rate reached 4.1 percent, the most since 1990. Gold is the sixth-best performer on the CRB Index this year, down 13 percent, the least of any precious metal. Steeper declines in silver and platinum may make those metals more attractive to investors than gold, analysts said. Silver futures for December delivery gained 22 cents, or 2.4 percent, to $9.55 an ounce on the Comex. The metal has fallen 36 percent this year. Platinum futures for January delivery rose $16.40, or 2 percent, to $837 an ounce on the Nymex. Palladium for December delivery fell $2.40, or 1.1 percent, to $215.30 an ounce. Lonmin Plc, the world's third-largest platinum producer, will cut at least 50,000 ounces of annual output, halt expansion and eliminate a third of jobs at its London headquarters. Platinum is used in pollution-control devices and jewelry. Platinum supply in 2008 will fall short of demand by 240,000 ounces, the most in five years, as global output drops faster than consumption because of mining disruptions in South Africa, said Johnson Matthey Plc, which makes a third of all autocatalysts, which use the metal. Platinum has plunged 64 percent from a record $2,308.80 on March 4 and is down 45 percent this year. Platinum may drop as low as $700 and rise as high as $1,400 in the next six months, Johnson Matthey said. Commodity prices will recover once the financial crisis eases, said Tom Hartmann, a commodity analyst at Altavista Worldwide Trading Inc. in Mission Viejo, California. Nov. 19 (Bloomberg) -- Crude oil was little changed in New York amid forecasts that a report will show U.S. oil supplies increased for an eighth week as a recession erodes global demand. Stockpiles probably climbed 1 million barrels in the week ended Nov. 14, according to the median of 12 analyst estimates before an Energy Department report today. The Organization of Petroleum Exporting Countries, the International Energy Agency and U.S. Energy Department slashed demand projections this month. Crude oil for December delivery rose 3 cents, or 0.1 percent, to $54.42 a barrel at 10:09 a.m. Sydney time on the New York Mercantile Exchange. Oil has dropped 63 percent since reaching a record $147.27 in July. Futures fell 56 cents, or 1 percent, to $54.39 a barrel yesterday, the lowest settlement since Jan. 29, 2007. Gasoline for December delivery fell 3.78 cents, or 3.2 percent, yesterday to $1.1368 a gallon in New York, the lowest settlement since the contract was introduced in October 2005. Prices rose earlier yesterday as a hijacked Saudi Arabian supertanker was anchored close to the Somali coast. Pirates directed the Sirius Star, the largest merchant ship ever seized, to the Eyl coastal area to the north of Somalia, the U.S. Navy said. The vessel is carrying 2 million barrels of crude oil. Brent crude oil for January settlement declined 47 cents, or 0.9 percent, to $51.84 a barrel on London's ICE Futures Europe exchange, the lowest settlement since Jan. 18, 2007. Nov. 19 (Bloomberg) -- The yen rose against the dollar on speculation U.S. lawmakers will fail to agree on a bailout for the country's automakers, prompting investors to pare higher- yielding assets funded with Japan's currency. The yen also gained against the Australian dollar and the British pound on concern the credit crisis may spread. A $700 billion financial stability package isn't intended to prevent General Motors Corp., Ford Motor Co. and Chrysler LLC from collapsing, Treasury Secretary Henry Paulson said in a House hearing yesterday. The yen climbed to 96.65 against the dollar at 9:35 a.m. in Tokyo from 97.03 late yesterday in New York. It rose to 122.15 per euro from 122.43. The euro bought $1.2633 from $1.2618. The pound was little changed at $1.4962. The yen may rise to 96.20 versus the dollar today, Yoshida said. The Australian dollar fell 0.9 percent to 62.72 yen from late yesterday in New York, while the New Zealand dollar declined 0.5 percent to 53.33 yen. The South African rand also slid 0.4 percent to 9.4410 yen. The yen is popular in carry trades, where purchases of higher-yielding assets are funded in nations with lower rates. Japan's benchmark rate of 0.3 percent compares with 1 percent in the U.S., 3.25 percent in Europe, 5.25 percent in Australia, 6.5 percent in New Zealand and 12 percent in South Africa. Japan's currency has advanced 13 percent versus the dollar, 33 percent against the euro and 52 percent against the Australian dollar in the past three months on slumping global economies. Nissan Motor Co., Japan's third-largest automaker, said profit in the second-half will go to ``zero'' because of lower sales in the U.S. and a stronger yen. Chief Executive Officer Carlos Ghosn made the comments in an interview with the Wall Street Journal, which were confirmed by Nissan spokesman Simon Sproule. The U.S. economy would suffer a ``catastrophic collapse'' if domestic carmakers fail, GM Chief Executive Rick Wagoner said yesterday, as the nation's auto industry renewed appeals to Congress for federal aid. Three million jobs would be lost within the first year, personal income would drop by $150 billion and government tax losses would total $156 billion over three years, Wagoner told a Senate panel. The dollar may fall before government reports today that economists estimate will show the housing recession at the heart of the U.S. economic downturn is deepening, bolstering the case for the Federal Reserve to cut interest rates. The ICE's Dollar Index, a gauge of the greenback against the currencies of six major trading partners, may snap two days of gains as futures traders raised bets that the Fed will lower borrowing costs in coming months. A U.S. report yesterday showed confidence among homebuilders dropped in November to the lowest level since record-keeping began in 1985. The dollar may weaken to 96.50 yen today, Saito said. The ICE's Dollar Index hasn't yet traded. It closed at 87.372 late in New York yesterday, from 86.807 on Nov. 17. Housing starts in the U.S. fell to a 780,000 annual pace in October, the lowest since records began in 1959, according to a Bloomberg News survey of economists. Building permits dropped to a 774,000 pace in October, the lowest since November 1981, a separate Bloomberg survey shows. The Commerce Department releases both reports at 8:30 a.m. in Washington. Futures on the Chicago Board of Trade show a 9 percent chance the Fed will reduce its 1 percent target rate for overnight bank loans to 0.25 percent by its Jan. 28 meeting, up from zero percent odds a day earlier. FKLI November contract retrace 18 points lower as compare to previous trading session at 873 with a total of 5964 lots traded in the market. FKLI was traded lower during trading session as most of the regional performing poor indication while Dow Jones futures electronic trading drop during the trading session. Technically, FKLI seems temporary bottomed at 873.5; 61.8% Fibonacci figures after manage to breach out from the descending triangle resistance trend line at 891 levels. 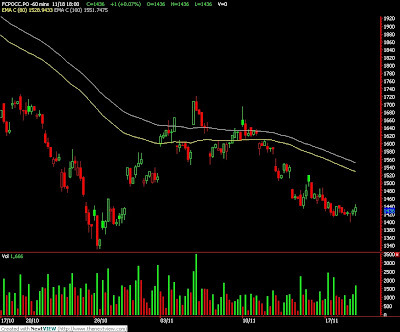 We expect FKLI would trade high in the coming trading session if support levels at 872 and 860 were up to against the selling pressure. Traders were advice to hold long position if resistances levels at 883.5 and 891 were breach in the coming trading session. FCPO January futures contract close almost unchanged at RM1436 as compare to previous trading session with a total of 6238 lots traded in the market. CPO price was traded sideways during the entire trading session as there not much market leads for price to trade on certain direction. Technically, CPO price was seen bottomed at RM1413 region as a sharp fall to test support at RM1400 region and ended with a Doji before starts to surge up in the hourly chart. Provided if the support levels at RM1413 and RM1400 were not violated, we have strong indication that CPO price might be traded high in the coming trading session while resistance were seen at RM1453 and RM1488 regions. Nov. 18 (Bloomberg) -- CLSA Asia-Pacific Markets cut its estimate for Malaysia’s 2009 corporate profits for the fourth time this year to reflect the downturn in banking, plantations and construction. Corporate earnings will shrink 18.7 percent next year, more than the 6.1 percent decline predicted on Oct. 20, Chin said. The benchmark Kuala Lumpur Composite Index may fall 12 percent to 776 next year, from 882.75 at the 12:30 p.m. lunch break today, she said. Investors should sell banks including Malayan Banking Bhd. and Bumiputra-Commerce Holdings Bhd., which will be hurt by rising bad debts and slower loan growth as a global economic recession takes hold, CLSA said. Planters including Sime Darby Bhd. will struggle to cover production costs amid declines in palm-oil prices, the report said. Profit at Malaysian banks may fall 29.6 percent next year, plantation companies 31.4 percent and builders 13.4 percent, Chin said. Shares of Malayan Banking, the biggest Malaysian bank, fell 10 sen, or 1.9 percent, to 5.20 ringgit at 11:52 a.m. local time. It’s down 44 percent this year, more than the benchmark Composite Index’s 39 percent decline. Sime, the largest palm oil producer, has slumped 46 percent this year. FCPO January futures contract retrace RM25 lower as compare to previous trading session to close at RM1435 level with a total of 8362 lots traded in the market. CPO price was traded lower as weak overnight closing for soybean oil and crude oil trading. Technically, CPO price seems holding above support levels at RM1413; 78.6% Fibonacci figure while a falling wedge was seen in the hourly chart. We expect FCPO would be trading upwards in the coming trading session provided it resistance levels at RM1453 and RM1488 were breach by strong buying interest. Traders were advice to hold long position in the coming trading session while being cautious around the support levels at RM1413 and RM1332. FKLI November contract rise 6.5 points higher compare to previous trading session at 891 with a total of 7392 lot traded in the market. FKLI was traded higher during the 2nd trading session due to most of the regional recovered from overnight Dow Jones weak closing. Technically, FKLI manage to close at 891 higher than previous high at 890.5 while seems break up from a descending triangle in the 15 minutes price chart. We expect this spurt was intended to complete wave 5 around 940 regions. Traders were advice to hold long position in the coming trading session while being cautious around the support levels at 880 and 860 regions. KUALA LUMPUR, Nov 17 (Reuters) - Malaysia may introduce a regulation to force palm oil millers to buy from oil palm smallholders, Commodities Minister Peter Chin said on Monday. Inventories of the vegetable oil rose to a record 2.09 million tonnes in October, resulting in millers running at near full capacity and making them reluctant to buy palm fruits from smallholders, which account for 40 percent of the country's total annual production. "The trouble is we have a peak fruiting season, most of the mills are running at full capacity. My sympathies are with the smallholders," Peter Chin told an industry seminar. "I am looking at regulations to compel millers to buy these fruits." Chin later told reporters he had directed industry regulator the Malaysian Palm Oil Board to investigate millers who refused to buy palm fruits. Oil closed at a 21-month low yesterday after the economy in Japan, the world's third-biggest oil-consuming country, contracted 0.4 percent in the third quarter. China National Petroleum Corp. said demand has fallen since September because of credit-market turmoil. Nov. 17 (Bloomberg) -- Gold fell in New York as the dollar climbed, reducing the appeal of the precious metal as an alternative investment. Platinum and silver also declined. The dollar gained against a weighted basket of six major currencies, extending a two-week rally. Precious meals often move in the opposite direction of the greenback. Gold fell 18 percent last month as the dollar rallied 7.8 percent. Nov. 18 (Bloomberg) -- The yen rose for a third day against the euro as growing evidence of a recession in the world's largest economies prompted investors to sell higher-yielding assets and pay back low-cost loans in Japan's currency. The yen also gained against the South African rand and the British pound on expectations Asian stocks will follow Wall Street lower. The Australian and New Zealand dollars declined on speculation a slowdown worldwide will crimp demand for the commodities the two countries export. FKLI 15 min forms a decending triangle, expect 2nd trading session to trade downward with support seen at 858 which is 61.8% fibonacci ratio. Failure to hold against selling pressure shall indicates further bear market. BEIJING, Nov 14 (Reuters) - China's soy and soyoil markets were expected to remain strong in the week ahead, although the outlook for soyoil weakened as supplies grew, while corn remained bearish on weak demand, according to a survey by an official think-tank. China's imports of soybeans remained robust even after the slide of domestic soy prices, but the price drop left domestic prices higher than imports, according to the survey by the official China National Grain and Oils Information Centre (CNGOIC). KUALA LUMPUR, Oct 17 - Malaysian crude palm oil futures are likely to hover at 1,600 ringgit per tonne as long as oil prices trade around $80 a barrel amid a slowdown in the global economy, top industry analyst Dorab Mistry said on Friday. Mistry said palm oil at 1,600 ringgit -- slightly more than a third above the break even point for mid-size plantation firms -- was also thanks to bumper harvests in top producers Malaysia and Indonesia while Asian demand cooled. He said prospects of palm getting channeled into biofuels could be slim unless prices continue to stay low for at least 8 to 10 weeks because margins are always erased when traders start locking in positions in anticipation of higher demand. "If crude oil is trading at or below $80 and the prognosis is for a weak economy and lower prices, then palm oil needs to get ahead of the curve and to demonstrate its price competitiveness," Mistry said in a speech to be delivered at an industry conference in China.